About two weeks ago Tom and I snuck away to a friend’s cabin at Hume Lake. It is one of our ways to obey Mark 6:31, “And he said to them, ‘Come away by yourselves to a quiet place and rest a while.’ For many were coming and going, and they had no leisure even to eat.” We needed to obey the first part of this verse in order to get relief from the second. I knew we were long overdue for a short sabbatical when we slept most of the first two days. Slowly the weight of the last year of ministry dissipated, and the year before us was order to a starting date three weeks away on the calendar. We quickly settled into our routine of quiet prayer and reading before the rest of the human world woke around us. By the time the people noises joined the bird chatter, Tom had usually completed his run around the lake, and I had breakfast cooking. Our morning discussions over the latest book we were reading together happened over a third cup of coffee on our large deck or at one of the outdoor tables at the Hume coffee shop. 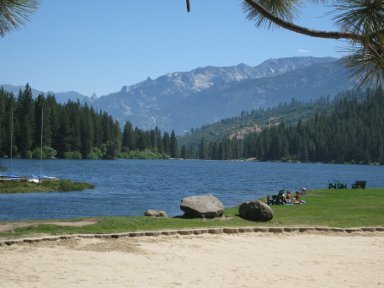 Other vacations spent at Hume have not always been so peaceful. In the past, we’ve had kids and friends with us—fun, but more busy than peaceful. This year we left the two youngest at home to house-sit and maintain their jobs of gardening and ice-cream scooping at Cold Stone. Without them, we still canoed, swam, and bought our coffee and malts from the cash Tom found on the bottom of the lake—a result of high school kids swimming with loose change in their open swimsuit pockets. Schedule more than one week of vacation at a time. It takes almost a week to unwind and another few days are needed to transition back into work mode. The middle days are for refreshing and renewal. This summer we scheduled three weeks in a row of vacation time. Reserve part of our vacation for just the two of us to enjoy—long days strung together without interruptions or responsibilities. Then move on to “people time”—enjoying family and friends. After our week at Hume Lake, we headed to Shell Beach, an ocean community, where we can connect with family and friends and still find quiet days to spend together. How do you structure your vacation time for rest and refreshing with the Lord? What has, or hasn’t, worked for you? Because I’m still on vacation and avoiding work, I’ve published this post on both my Holy in the Daily blog and our Sabbath and Sabbatical blog.